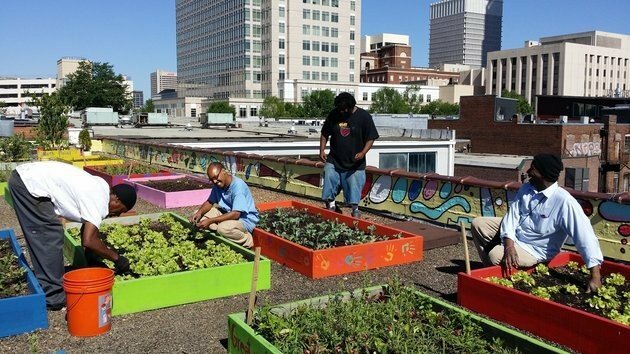 Atlanta, GA – A forward thinking homeless shelter in Atlanta is home to a massive rooftop garden, but what makes this garden unique is that the residents of the shelter are the ones that planted it. Realizing that processed foods and snacks are relatively cheap, and that eating healthy food can be much more expensive, the shelter incorporated the program to allow residents to grow their own nutritious food. The initiative teaches residents a valuable life skill while allowing for people to take a measure of ownership over their own lives. The gardening program, managed by the Metro Atlanta Task Force for the Homeless, works to allow homeless people access to food previously considered out-of-reach. In addition to the gardening initiative, the task force also operates a 24-hr assistance line, a transitional housing program, and a day service center. The program began in 2009, with the goal of teaching homeless people about sustainable urban food production, while at the same time allowing residents to empower themselves by providing for the food needs of themselves and their fellow residents. “The idea is to produce enough to feed the residents something green and healthy daily,” Carl Hartrampf, a board member who manages all aspects of the garden, told Vice. Residents of the shelter are responsible for 80 separate garden beds, which produce carrots, kale, and squash, along with numerous other vegetables. The first harvest from the garden produced 55 pounds of produce. The program prepares the homeless residents for careers in entrepreneurial farming and marketing, and also certifies them to train future participants, according to the Huffington Post. Each day a full meal, using the freshly picked produce from the garden, is available on site. The combination of providing healthy meals, while teaching important real-world job skills, is a winning recipe in helping to empower the homeless.